I’m not sure how it happens, but you always arrive before I’ve even had time to fully enjoy the weekend! I hope all of you lovelies had a wonderful weekend. I spent a lot of mine snuggled up in bed or on the couch with a cold. Colds may be a pretty tame ailment, but there is nothing worse than the start of a cold when it feels like you go through a box of tissues in one sitting and you sneeze a minimum of 15 times in 10 minutes. Cute…I know. Luckily I had sweet Stella (and my husband, of course) to keep me company. We watched a lot of football and The Office (my new favorite show…how I am just discovering it?!). Hopefully this week will go easy on me! I’ve already worn multiple capes/ponchos/ruanas (what exactly is their official name?!) on the blog. It is my favorite way to stay warm and cozy this fall. This grey option is currently my favorite as it goes with just about anything and I am obsessed with the tassels on the bottom. It is great quality and really does a good job of keeping me warm! You can’t see her, but in over half of the pictures we took this day, Stella was wandering around at my feet. She just got a haircut (as seen below) and it has completely changed her look! 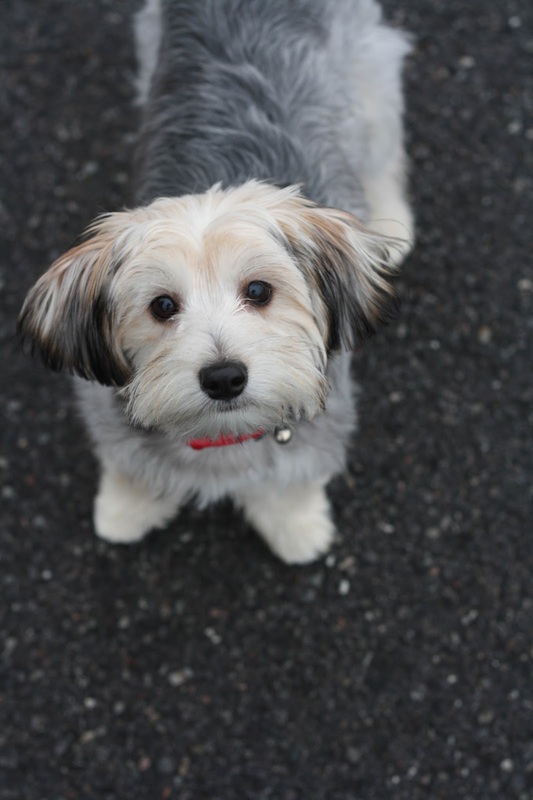 I am so in love with my sweet pup…yes, I am a crazy dog-mama! Two colors I have been extremely drawn to this fall are olive and navy. They just seem to compliment each other so well and are such a cozy combo for this time of year! I also adore a good boxy sweater and this one definitely fits the bill! Paired with a pair of skinny jeans and a good pair of boots, this is an easy to wear outfit for any fall day! This week’s blogger of the week from last weeks link-up is Cassie of Simply Classy! I am loving Cassie’s neutral look, spiced up with a little leopard! Also obsessing over her bag! This look is so simply chic that I am dying to re-create it ASAP! Thanks for the inspo, gorgeous girl! This combo is one I have been wearing SO frequently lately! There is just something about plaid and stripes that makes for the perfect combo! Topped with a cargo jacket and a floppy hat, this outfit is the epitome of cozy fall apparel! This scarf is currently sold out, but check back often! It has been a popular one and already re-stocked twice! This week it’s finally been chilly enough to pull out my warm coats! While this is somewhat exciting, I am not enjoying the weather that quickly went from cool to freezing. Today I had morning supervision at school and wore a sweater, scarf, vest, heavy jacket and gloves. Just another reminder that the weather will soon be this way every day and leaving the house will require layers upon layers! This jacket from Coffee Shop is one of my new favorites! Warm and trendy? Yes please! I am obsessed with the black and white checked print and love that it is big enough to layer under. This will definitely come in handy as the weather continues to drop! I paired it with the sweetest layered top and green skinnies. This top is one size fits all, but fits more like a small. I definitely recommend picking this one up as the quality is awesome for the price point (just $30!). In honor of last week’s Halloween festivities, this weeks blogger of the week from last weeks link-up is Shannon of Upbeat Soles! 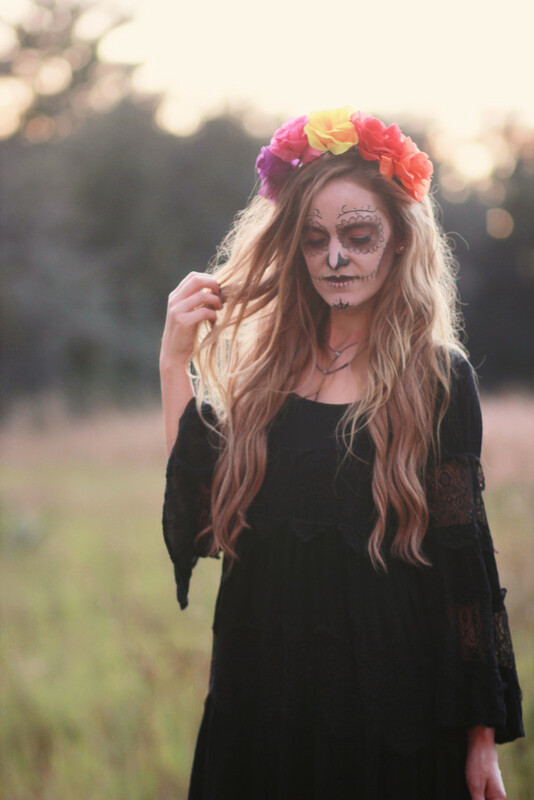 I can’t get over her amazing sugar skull costume! She has definitely inspired me for next year! !